DNA collection using an easily obtained cheek swab saliva sample. Fast, proprietary and confidential genetic profiling of the child and alleged father with 99.999% probability/accuracy of results. In the common DNA paternity case, the alleged father and child are tested using both PCR and RFLP methodologies. Results for a DNA paternity case are available in an average of 3-4 days from receipt by the laboratory. Cheek swab saliva testing can be done immediately after birth, and typically the child and alleged father are tested. Results exclude or confirm the biological father with an accuracy rate exceeding 99.9%. Paternity Testing simply means establishing fatherhood. Everyone is born with a unique genetic blueprint known as DNA (DeoxyriboNucleic Acid). Because the DNA molecular structure and genetic characteristics of a child are inherited from or determined by the DNA structure of the biological mother and father, DNA identification provides a conclusive and definitive way to establish biological relationships. Consequently, DNA testing has become the most accepted method to determine identity within the legal and scientific communities. Genetica DNA Laboratories is a global provider of the Genetica DNA Paternity Test�, the most accurate DNA relationship test available, processed in their FDA certified genetic laboratory by a staff of highly trained professional physicians, microbiologists and lab technicians with an absolute and strict adherence to client confidentiality. One of the first laboratories in the United States to receive accreditation from the American Association of Blood Banks (AABB) for DNA parentage testing, Genetica Laboratories is the first to offer a written client guarantee that the accuracy of their test results will be greater than 99.9%. Using both the preferred standard methods for DNA genetic matching and confirmation, PCR and RFLP, exclusion or inclusion of a parent's DNA to that of a child results in a probability factor of 99.999999% or 1 in 10 billion of the population. See a Technical Discussion on DNA parentage testing. Technologies employed for each DNA paternity test are PCR (Polymerase Chain Reaction) and RFLP (Restriction Fragment Length Polymorphism). DNA Testing with RFLP: In the RFLP method of testing, the DNA isolated from the sample is cut into fragments by enzymes. Then, an electric current is used to separate DNA fragments by size. The separated DNA fragments are identified with DNA probes. These probes are pieces of custom made DNA that bind and identify a specific gene locus. DNA parentage testing is normally done to confirm or exclude the alleged biological father of a child. The DNA test is accomplished by taking buccal saliva samples from the child and alleged father. Along with the required forms, the samples are sent to the laboratory for DNA extraction and processing. Results are generally available within 3 days after receipt by the laboratory. Results are submitted to the client as an exclusionary or exclusionary report along with the laboratory's guarantee of accuracy. An expedited overnight service is also available at additional cost. 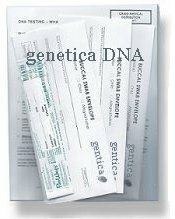 The standard Genetica prepaid DNA testing service includes sterile sample collection swabs and identification depository envelopes for the child and alleged father, required laboratory forms, sample collection and labeling instructions and a pre-addressed return envelope for submitting test materials to the laboratory. The Expedited Overnight testing option includes a prepaid FEDEX overnight mailer for sample submission to the laboratory. Cheek swab samples are obtained from the child and alleged father using the sterile swabs provided. Completed forms and samples are sent to the Genetica DNA testing laboratory. Samples are checked in, identified with tracking numbers and unique test codes and assigned a confidential case file. DNA is extracted from the cheek swab samples for the mother. child and alleged father. Identification of similar and dissimilar genetic markers and test result. Upon receipt at the testing laboratory, each DNA paternity test is assigned a confidential case file identification number. Progress on each case can be monitored on line with the laboratory. Completion of DNA profiling and paternity conclusions are generally available in 3 business days after sample receipt by the laboratory. Paternity DNA test results and conclusions are reported by the laboratory in comprehensive and detailed format. Two possible test result forms are provided depending on the inclusion or exclusion of the alleged father's DNA. To view sample laboratory reports see the Inclusion Result Report or Exclusion Result Report. 2. The probability of paternity for the GENETICA DNA Test� is greater than 99.9% and we document that more than 99.9% of the male population cannot be the biological father of the tested child." The Genetica DNA Paternity test is available in two versions, Standard and Expedited Overnight, to individuals or entities with a specific need to establish true and absolute paternal identity of a newborn, child or adult. Standard test results are generally available in 3 days after receipt by the laboratory. Expedited Overnight test results are available on the following day of receipt by the laboratory. Costs are all inclusive and there are no fees beyond the price for each test kit other than sample return postage to the laboratory. All test materials, documentation and laboratory fees are included. Note to NY Residents: due to NY State restrictions, this kit may not be sold to NY State Residents.